POLITICAL TIDBITS: While the nation continues to pray for Mary Jane Veloso's deliverance, it becomes even more imperative to impress OFWs with tragic consequences of breaking laws of host country. And catch evil manipulators who prey on naivete of our compatriots or the grinding poverty they seek to escape from. Nepal of my fonder dreams in total shambles. While the nation continues to pray for Mary Jane Veloso's deliverance, it becomes even more imperative to impress OFWs with tragic consequences of breaking laws of host country. And catch evil manipulators who prey on naivete of our compatriots or the grinding poverty they seek to escape from. Nepal of my fonder dreams in total shambles. From all indications, as I write this blog tonight, Filipino citizen Mary Jane Veloso may not be saved from a death sentence. News reports from Indonesia state she's scheduled to die at 6 pm. tomorrow (Tuesday) Manila time, by firing squad, along with nine or ten others of various nationalities---all of them accused of drug trafficking. The plight of the "drug mules" to be executed in Indonesia has captured the attention and imagination of the world, inasmuch as the death penalty that Indonesia still imposes on certain crimes have already been erased from statute books of many nations---including ours. Thus, Indon President Joko Widodo found himself at the receiving end of strong pleadings from his counterparts around the world whose nationals await execution. Among them were ex-PM and now Foreign Minister Julie Bishop of Australia, French President Francois Hollande and PH President Benigno Aquino III, who presumably collared his Indon colleague at the Asean Summit in KL about Veloso. From the US, even Manny Pacquiao is pleading for Veloso. 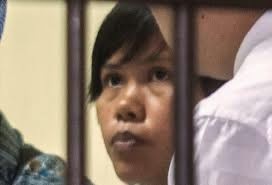 I'd hazard the guess that had Veloso been alone in this case, it might have been easier for Widodo to apply pressure on the Indon court to give her a reprieve (especially since Widodo was a recent state guest in Manila). But because many other nationalities were also due for the firing squad, commuting the death sentence of just one criminal would be tough to do. I found UN Chief Ban’s pleading on abolition of capital punishment a positive development, as this dovetails with that of the Catholic Church which had vigorously fought against it for a long time. The Church position is that until a person breathes his or her last, he or she is capable of true contrition, which could save the penitent from eternal damnation. At this point the Filipino people are solid in praying for commutation of the execution sentence slapped on this 30-year old single mother of two children who was arrested in 2009 with 2.6 kilos of heroin sewn into the lining of her donated suitcase. Until now, Veloso has insisted that she traveled abroad to seek work as a maid and that she was duped into accepting the luggage by her Filipino female recruiter. That recruiter disappeared after news of the imposed death sentence on Veloso surfaced and there should be a nationwide manhunt for her. This is now the point where the job of our law-enforcers has to start: the sacrifice of her life that Mary Jane Veloso is about to make should not be in vain and the recruiter has to be apprehended at all costs and subject to investigation and trial; if guilty she has to answer for her crime. A second point is: whether Veloso was telling the truth about not knowing what that valise carried is now moot and academic. What has to be done is to ENSURE that every Filipino who leaves for foreign shores to work ought to understand the CONSEQUENCES of his action---that if he transgresses the laws of the host country he'll pay the high price. Laws of other countries that could possibly affect our OFWs' stay ought to be spelled out to them as well as the severe consequences of transgressions. Many countries are quite harsh about drug-trafficking (PH is about the only one lax about this crime). When I was in China in the second semester of 2010 to accompany my husband for treatment in a cancer hospital in Guangzhou, I learned from our Filipina consul there that there were over a hundred of our kababayans locked up in jails in that city alone for one crime---DRUG TRAFFICKING. Many other Pinoys are locked up in other parts of the world too for the same crime. What should be done by the Labor Department and OWWA is to compile the total list of Filipinos in jail around the world and for various crimes and this complete picture ought to be shown to all those applying to work abroad.This ought to scare the daylight out of those who want to connive with drug-dealers. The situation is no longer funny. Aside from our national pride that has been dealt a terrible blow in the Veloso case (again! ), our people's lives are being put in danger--- some from sheer naivete and stupidity, but some due to their desire to profit and make money from traffic of drugs. Most of these drug mules are looking for relief from grinding poverty caused, in large part, by the corruption of politicians in our midst. But after what happened to Mary Jane Veloso, there ought to be intense drilling by DOLE and OWWA on harsh realities for Pinoys going overseas for employment. Early in 2010 my husband and I were privileged to visit Nepal to attend an international parliamentarians’ assembly, on the invitation of former Speaker Jose de Venecia. Kathmandu, Nepal's capital, reminded me a lot of Phnom Penh, capital of Cambodia, in the earlier days of my husband’s assignment there as the first Philippine ambassador just after the UN-supervised free elections in the mid-90s. Nepalese people were quite friendly and helpful, but the drivers were quite chaotic, driving like insane so that one had to close one’s eyes so as not to suffer a heart attack. The Nepal we saw was beautiful and of course dominated by Mt. Everest whose peak would play hide and seek with the clouds throughout the year. One early morning, the PH delegation was all strapped in a small plane, waiting to fly over Everest's peak, but no dice---it was zero visibility. Nepal's old towns were beautiful with their Oriental structures fashioned from wood trunks in distinctive architecture. Durbar Square, the heart of Kathmandu, was particularly charming with its unique structures and the myriad shops that gave it the inimitable Oriental bazaar atmosphere. One afternoon in the Heritage town of Baktapur south of Katmandu, I sat on a rooftop café and looked out on a narrow winding road going east and upward---it was the road to Tibet, a journey of some days where the atmosphere would get more rarified as one climbed up. I was completely taken by the scenery. 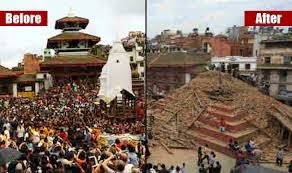 Today Nepal is in terrible shambles, after a 7.9 magnitude earthquake hit it the other day, and many of the quaint and ancient wooden buildings are tottering or have been flattened to the ground. Over 3,200 Nepalese have perished and scores injured while many more people are still lying under the rubble. Rescue is delayed by the narrowness of Nepal’s highways and streets. Heartbreaking too is that so many tourists ascending Everest in the spring season were swallowed up by deadly avalanches triggered when the mountain began to shake after the quake struck. Some were rescued by international teams but many more will remain probably buried forever in the snows. When the great earthquake struck the southern part of China some years back, which also saw tens of thousands of people killed, I read with great interest the explanation of scientists about what triggered that gigantic quake---Their scientific opinion has become reality again. The scientists opined that the great land mass of India was once actually a huge island separated from mainland Asia. Some 25 million years ago, however, the Indian land mass managed to get connected and became the subcontinent of Asia. The continuing thrust of the tectonic plates beneath the Indian land mass, however, continued upward toward the Asian continent. That’s how scientists explained the recent earthquake in Nepal. The Indian tectonic plates have not stopped moving and scientists estimate that the shaking would take place every 75 years. This propensity for upward movement beneath the earth in the Asian sub- continent has to be addressed with greater understanding and better technology, e.g., buildings that can withstand certain intensities---even if it means giving up, sadly, heritage for safety. Nepal is a clear case.